Keep up with the style set with one of our on trend fedora hats. A fedora is the perfect hat to help you to transform a plain outfit to something much more stylish. At Hostie Hats we have 7 great fedoras to choose from, starting from only £49. Each of our fedoras is fully customisable so you can choose the perfect colour and hat band combination to suit you at no extra cost. You can choose from a range of 8 base colours from blacks and greys to warm wine tones and even teal for the ultimate colour pop! Not only can you choose your fedora base colour but there are numerous hat band options depending on the hat style you choose. 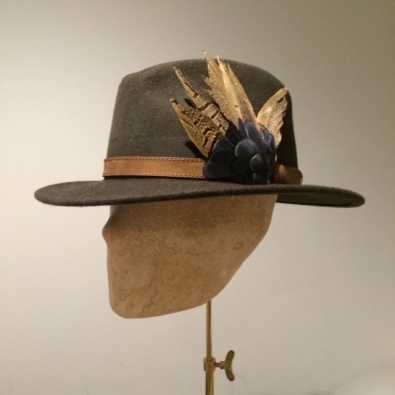 You can choose a fedora with a simple grosgrain band, a beautiful beaded band in black, ivory or multi, feathered bands which can be dusted with an accent colour or full on pheasant feather fabulousness to make a real statement. We can make your fedora in a range of colours at no extra cost, just select your chosen colour below and we will send you a colour swatch so you can be sure of the exact colour of the fedora hat you are ordering.